New AreaMax™ product feature supports wireless nodes with 0-10V dimming and monitoring, key component of networked ‘Smart City’ lighting solutions. April, 12 2017…Renton, WA. 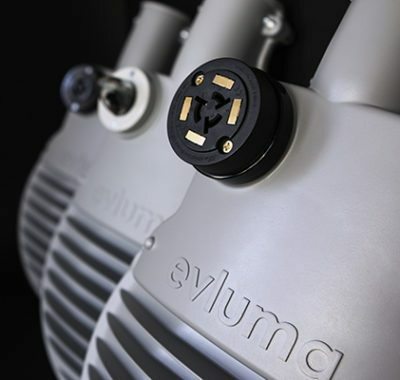 LED lighting manufacturer Evluma announces the availability of a 7 pin option for the AreaMax™ LED luminaire for Street and Area Lighting. In compliance with ANSI C136.41-2013 Standard for Roadway and Area Lighting Equipment–Dimming Control between an External Locking Type Photocontrol and Ballast or Driver, the AreaMax 7 pin model supports 0-10V dimming and the power and voltage monitoring features of most wireless controls nodes. Already well known for energy and maintenance savings features, such as Photocontrol Failsafe™ and ConnectLED™, the new option opens the doorway to additional savings and functionality for owners of the versatile AreaMax. Wireless control nodes only connect to luminaires with a compatible 7 pin twist-lock receptacle as they depend on power from the luminaire. All AreaMax with the new 7 pin socket will maintain the ability to communicate with ConnectLED preserving the ability to set brightness settings and dimming schedules and easy connect/disconnect using the app. “Many luminaries may also require a driver upgrade to support 0-10V dimming. The AreaMax driver has been designed for dimming since inception.” Evluma’s 7 pin socket configuration also supports available nodes with motion control capability. Unlike some competitive products the current inrush to the AreaMax 7 pin receptacle is extremely low, helping to preserve the life of expensive wireless node relays. AreaMax with the 7 pin option are available for order immediately. Other AreaMax options include a coastal-grade casting and hardware package and 3000K IDA (International Dark Sky) approved models in both Type V and Type III. All AreaMax carry a 10-year warranty. On display at the NWPPA E & O, Reno, NV April 11-13 and the IEEE REPC in Columbus, OH April 23-26, 2017.